Newt Gingrich. Apparently it's considered tacky or worse to insist on the truth. But imagine, for the sake of argument, that what Gingrich says is true. So what? If Palestinians are just an undifferentiated group of Arabs who happen to live in the West Bank and Gaza, what are the implications of that? But more importantly, Gingrich is laying out a perverse definition of statehood. 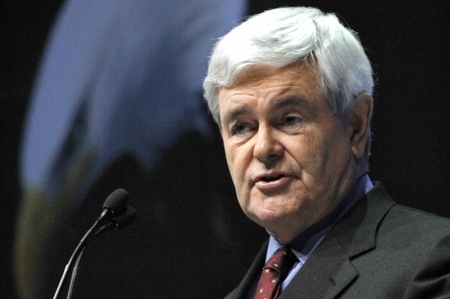 Does Gingrich think that states should be ethnocentric? The United States isn’t, although Gingrich’s appeal is largely based on white Christian ethnocentric nationalism. Israeli national identity is as much a twentieth-century invention as Palestinian identity. 2. The Palestinians are not simply asking for self-government for the residents of Judea and Samaria. If they were, they would not be able to insist that the Jewish communities there must be dismantled. They would not be able to demand that Arab refugees from 1948 and their descendents have a ‘right of return’ to Israel. They would not refuse to accept Israel’s own self-definition. They are demanding recognition as a nation and to establish a nation-state. 3. I can agree that whether the Palestinians are “just an undifferentiated group of Arabs” or a ‘people’ is not the only thing, or even the main thing, that is relevant to whether they should have a state. Since their state is planned to be next door to Israel, and indeed, if it is established it will be in the historical heart of the land of Israel, the attitude of this bunch of Arabs toward Israel and Jews is extremely important. As as Gingrich pointed out in some of the quotations that were not widely remarked upon, this attitude is anything but peaceful and neighborly. 5. There is also the question of intent. The Palestinian Arabs have for decades been doing their best to deny Jewish history, to substitute themselves for the Jews as the original inhabitants of the land, making the most outrageous claims (like being descendents of the biblical Jebusites), destroying archaeological evidence of Jewish provenance, claiming Jewish historical and religious sites as their own, etc. Arab lies are intended to delegitimize the historical right of the Jewish people to have a state, and to aid in the destruction of it. If the ‘Palestinian people’ were invented, it was just for this purpose. It seems that despite the lip service that is paid to historical truth, it is considered tacky or worse to point out that this particular emperor has no clothes. But in the real world, the US president has to make decisions. Good ones aren’t likely to come from fairy tales. Theoretically — and I hope in fact it is true — the main objective of our Israeli/Arab policy is to end the conflict. This cannot occur as long as the history of it and a realistic understanding of the objectives of both sides, even an identification of all the players — it is not just Israel and the Palestinians — is not present. Our current president does not have this understanding, and indeed the administration’s Orwellian restrictions on language about the Middle East in general make it impossible for them to even speak about it sensibly. Gingrich is a breath of fresh air in this respect. This entry was posted on Tuesday, December 13th, 2011 at 3:36 pm and is filed under General. You can follow any responses to this entry through the RSS 2.0 feed. Both comments and pings are currently closed. Gingrich is to be commended in the highest way for telling the truth. It is about time someone on his level and of his importance contradicted openly the ‘myth’ the Palestinians have sold to the world. He is not a fool and knew the condemnation he might receive for telling the truth. Perhaps this courage to be honest will convince the ‘voters- in- the -middle’ that despite the talk of his extremism he is the right person to lead the United States. This man is an incompetent stooge. If you think he is the right person to “lead” the United States, you are a dangerously-thinking person. He certainly is correct in his historical claims, but he would make a horrific president for both the US and Israel. The Arabs local to Palestine had been murdering Jews in Palestine since the 20’s. The Muslim Brotherhood was formed in Egypt in 1928. Haj Amin al Husseini, a member, imported it into Palestine, next door. It was not until the petrodollars became available that this third wave of global jihad commenced against the West because of the lack of financing to the Brotherhood a Sunni group, its subsidiaries and similar thinking groups in the Shia and Deobandi. See: Brand, The Third Wave, http://www.think-israel.org/brand.thirdwave.html The Soviet invention changed Arafat’s slogan from “annihilating all the Jews or driving them into the sea”, to “liberating the Palestine Arab People”. This victimhood canon would be effective with the left wing, especially left wing Jews even if they weren’t specially favorable to the Soviet spin. From then on it was not “attack” but “resist” even though the actions were plainly attacks. This reframing of the issue by the Soviet dezinformatsia has been extremely effective. During the 60s and early 70s the Soviets formed several liberation organizations but I think the PLO has been the most effective.